Panaromic photograph of the interior of the Charles Anderson Grove Community Centre. Black and white image of The George Hotel in Lydiard Street, Ballarat. Black and white image of Goodfellow's cordial factory. 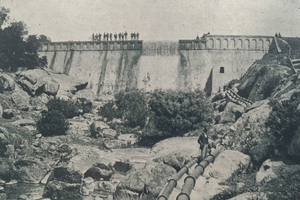 Black and white image of the dam at the Maryborough Town Hall awater supply. 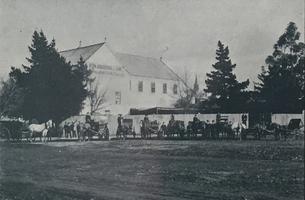 Black and white imahe of the Maryborough Town Hall and Port Office, with horse drawn vehicles in the foreground. Image of John Cowley, member of the Old Colonists' Associtation. Image of Thomas Stoddart, member of the Old Colonists' Associtation. Image of Walter Cornell, member of the Old Colonists' Associtation. Brick cottages at the Ballarat Old Colonists' Association Retirement Village. The Farrer Cottage was built in 1956. Brick cottage known as the Mitchell Cottage. Colour photographs 15 new units under construction at the Old Colonists' Association Charles Anderson Grove Retirement Village. Columns and other architectural features on the balcony of the Old Colonists' Hall. Sculptural portrait of John Murray, President of the Old Colonists' Association, Ballarat. A newspaper article from 'Ballarat News'. Four members of the Old Colonists' Association, Vince Braybrook, Andrew Tweedie, Andrew Robson and Ian Fraser, are photographed in front of the new community centre at the Old Colonists' Association Retirement Village at Charles Anderson Grove. The Old Colonists' Association provides affordable housing for pensioners, and undertook the biggest building project since the first cottages were built in the 1920s. One of the oldest charities in Ballarat, the Old Colonists' Association initially assisted miners and their families who were in financial difficulty, including assisting with funeral expenses and providing wood and other essential services for their homes. The cottages in the retirement village are funded by the Association and while rent is charged to the pensioners, it is only a percentage of their pension and is highly subsidized. Send an email to Old Colonists' Association of Ballarat Inc.